We're sorry, but this item is no longer for sale. However, there may be more Apple Watch Accessories » Apple Watch Stands » Stands with Charger items available. TimePorter for Apple Watch sets the standard for how you carry your essential Watch accessories. 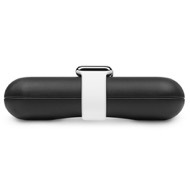 This gorgeous capsule is both a case and a stand that holds your charging cable, extra Watch band, USB charger and more in a neatly designed, silicone-lined case (accessories not included). 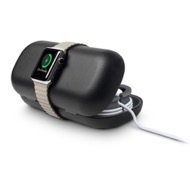 Pop your charging disc into the integrated opening in TimePorter and drape Apple Watch across the top to charge. With Apple Watch resting on TimePorter, open the case to the preferred angle and TimePorter transforms into a display stand, perfect for viewing notifications and the time. What can you fit inside TimePorter? Everything you need to dress and power your Watch, including the extra-long Apple charging cable. There's room for an extra band so you can carry the sport band you use when running or working out. 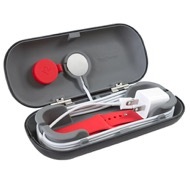 You can also fit your Apple Watch USB adapter (US or International) inside this compact case. How's that for convenience? Anyone who has traveled with the extra-long Watch cable knows how unruly it can be. TimePorter neatly spools the lengthy cable and feeds out just enough cable to reach the nearest outlet. An integrated portal holds the charging disc flush with the outer surface of TimePorter so you can lay your Watch across the leather case for charging. TimePorter keeps your charging cable from tangling and eliminates that hornets nest of cable on tiny hotel nightstands. Once you have the charging disc in place, slip the band under the contoured bottom of the case and you have the most convenient travel display stand ever. The multi-angle case top can be adjusted to give you the perfect view of incoming notifications and alerts while your Watch charges. For those who prefer nightstand mode, lay your watch across TimePorter horizontally and angle the case open to view while Apple's magnetic charging disc holds your Watch in place. With all these options, TimePorter is Watch's perfect bedside companion when you're sleeping in a hotel or Airbnb. 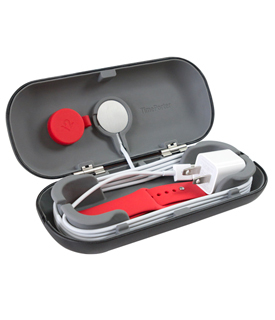 Drop a USB battery charger inside TimePorter. Plug in your Watch charging cable and just like that, you now have a wireless charging station for your Watch. A great option for when power outlets are scarce or for those once in a blue moon international trips where you'd rather not spring for an international power converter. With a USB battery on the inside and your iPhone charging on the outside, you have an ultra cool and tidy Watch charging station.